It was late winter and we were walking down the street into Çalış, one day. As we turned the corner and peered over the wall that was once Lokal, we saw a few guys in discussion. A shout of hello and a guy we’ve known for some time came running over. It was owner of King’s Garden Restaurant, Salih. A quick conversation of ‘I’ve taken this place on now,’ and a few weeks later Babzen Kebab was open for business. And what a great idea it was, too. We watched developments each time we walked by and waited for opening day. As soon as we saw Salih’s Facebook and Instagram update, we decided to do the ‘Barry’s mum experiment’ and take her along to see if it got her seal of approval. Kebab places are ten-a-penny around Fethiye – around Turkey, for that matter – but to have a dedicated kebab restaurant in Çalış. Well, happy days! Yes we’ve got our favourite Çalış snack joint, Çalış Kebabs & Dürüm, but to have somewhere to go for a sit down meal of quality kebab and meze without pages of extra additions to the menu. Babzen Kebab is just so welcome for this neighbourhood. So, yeah, we were chomping at the bit to give Babzen Kebab a go. If you’re gonna specialise in kebabs, they’re gonna have to be good, otherwise you’ve got a problem, haven’t you? But if you get it right – oh, how we love a good kebab joint! The first time we went – early birds and all that – the menus hadn’t even been printed. The display fridge had only been delivered that day and was still being set up so the waiter had to rhyme off a few kebabs we might like to order. He didn’t need to go too far. Barry’s mum stopped him at chicken şiş and we stopped him at Adana Kebab. But be sure to take your appetite with you to Babzen Kebab. We’ve been twice now and when you’ve ordered your kebabs, before they arrive at your table some little foodie treats are first. Freshly rolled and baked lavaş puffy bread and a selection of meze. The meze selection has been slightly different each time. This was the offering for our second visit: Yoğurtlu havuç (sauteed carrot in yoghurt), haydari (yoghurt with mint), Antep Ezmesi – every meze table should have one – and a lovely addition of çiğ köfte; the vegetarian version. Oh, and a bit of spiced butter, too. How can you resist hot lavaş bread with melted butter and all this meze to dollop on top of each piece you tear off? It’s always a toughie to plant your flag and say, “Yes, this is the best,” but we will say, the quality of the Adana Kebab at Babzen Kebab is exceptional. Salih’s managed to get hold of a good kebab chef who has worked elsewhere around Turkey. He’s also using a local butcher who has his own animals. Yes, locally sourced meat at Babzen Kebab. And, as you can see in the photo, there are actually chilli flakes and spices in the meat. Adana Kebab is supposed to be spicy! This is a rarity in Fethiye. It really is a quality Adana, here. The meat in a good Adana Kebab is also not minced. The chefs at Babzen Kebab are finely chopping the meat over and over again until it’s in tiny pieces, almost resembling mince but still with bite. It’s then molded onto the skewer and refrigerated until it’s time to grill over the open coals. Our kebabs were served with the traditional accompaniments: Charred pepper and tomato; raw, shredded onion, garnished with sumac, lavaş bread and bulgur pilaf. A personal choice but this is a winner for us. We much prefer a grilled kebab to be served with bulgur rather than Turkish-style rice. And if you’re anything like us, you’ll love an eatery that has an open kitchen where you can see everything that’s going on. Babzen Kebab has this open kitchen. The bread oven is on the right where you can watch your lavaş bread, pide or pizza being prepared and baked. All the kebabs are barbecued over coals behind the glass screen on the counter. And meats and meze are displayed in the fridge at the far left. So, what about our second little outing to Babzen Kebab? Well, by then, things were a tad more established and the menus had arrived. And we don’t want you to go thinking we just live off chicken şiş and Adana Kebab (that’s what we also had at Boğaziçi Restaurant, recently, too). We ordered something different! You see, the Babzen Kebab Instagram account and Facebook page are also a bit more established, too, and we’d seen photos of the impressive-looking Turkish village breakfast and also the even more impressive-looking family kebab for 6 people. Apart from chicken (without the bone or skin), Barry’s mum isn’t a meat eater, so her little browse through the compact menu made her day. 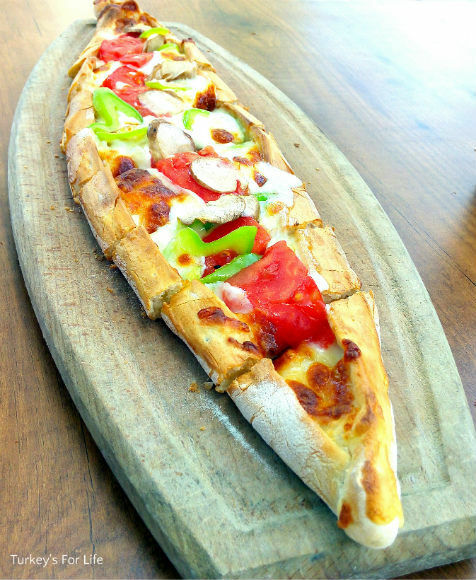 She spotted the vegetable pide and ordered that. We’d had our eyes on this family kebab – the photo seemed to keep popping up everywhere on social media – and we really wanted that. So, we were the awkward customers on this occasion. We ordered a mixed family kebab but asked could we have it for two people. It was the first time they’d done it for two, but yes we could! Yummy! It was basically a taster session of some of the grilled kebabs on offer at Babzen. Lamb şiş, beef şiş, chicken şiş, chicken wings, liver şiş and there’s a sample of the Adana again. The onion, tomato, peppers and bulgur pilaf were there again, as was the lavaş bread. This time, we also got some tangly pickled red cabbage, too. Factor in that we’d eaten the meze and bread in the top photo, too…we were a bit full by the time we left Babzen Kebab on this occasion! Hats off to Salih for Babzen Kebab! The menu doesn’t go over the top. You can order and pay for hot and cold meze seprately, if you like. 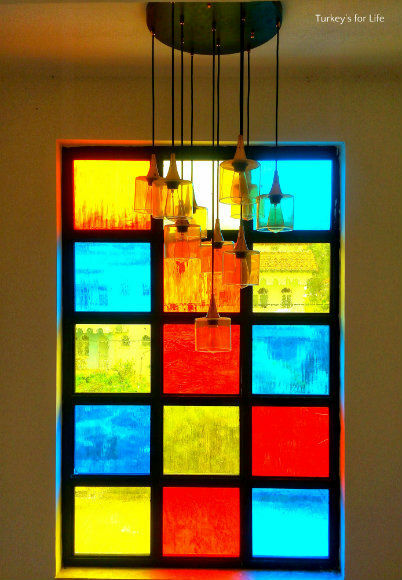 Our friends went recently and just dined on a selection of meze. As well as a table full of Turkish breakfast, there are other breakfast snacks such as menemen and sucuklu yumurta. There are some traditional salads that accompany kebabs, perfectly. You can get güveç (casseroles), pide and pizza. There’s a kids’ menu, and, if you don’t want a full plate kebab, you can also get dürüm (wraps). And, as well as the grilled şiş kebabs, there’s also a selection of regional and specialist kebabs, too. It’s kebab heaven! Now, we also happened to know, from its previous incarnation, that there are rooms available for rent in this building so we asked Salih if he would be renting the rooms out…and if we could have a little look around. There’s only a few rooms but they’re modern and spacious. 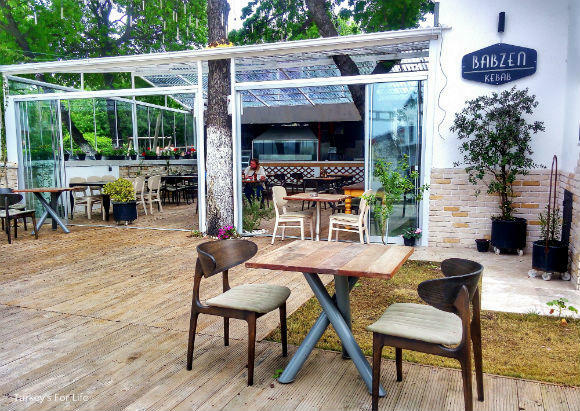 If you’re in Turkey on a budget stay – or if you can’t be bothered to move after you’ve eaten all that kebab – then a stay at Belis Garden, the hotel in the grounds of Babzen Kebab, looks like it could be quite pleasant. 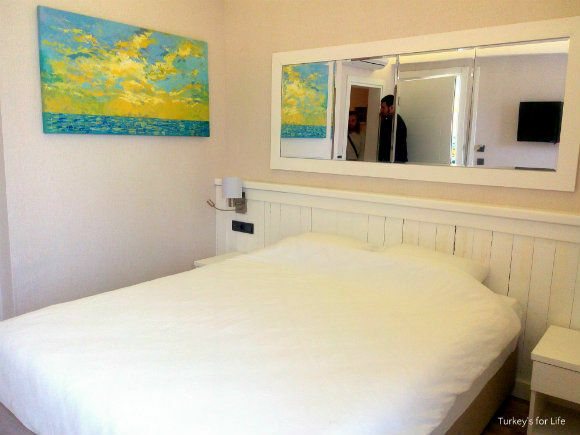 Rooms are double rooms and all named after local bays such as Soğuksu Koyu – Cold Water Bay – and Günlüklü. As well as bed and bedside tables, there’s wardrobe space, dressing table and wall-mounted flat screen TVs. 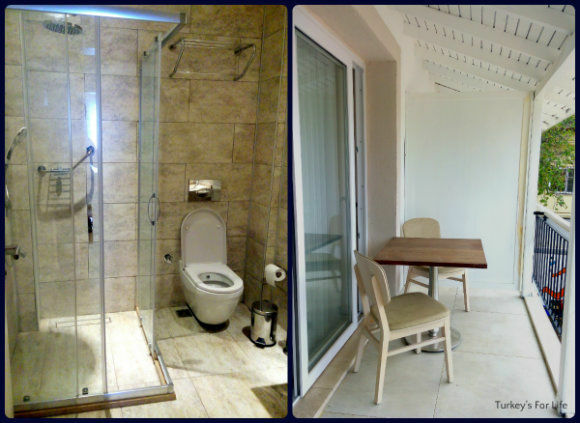 All rooms have modern bathrooms and upstairs rooms also have a balcony with table and chairs. It was only a quick look around that we did – we like to be nosy and Barry’s mum was in her element. She loves to tour the local accommodation offerings! A gentle 5 minute stroll to Çalış Beach, on the dolmuş route to Fethiye centre; we’d guess these rooms are going to tick over quite nicely. 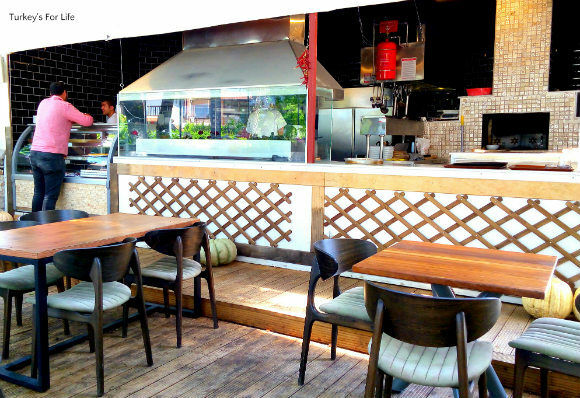 Babzen Kebab is on Barış Manço Bulvarı – the main road leading straight away from the main Çalış Beach entrance. The restaurant is open daily from morning til late and prices are reasonable. For enquiries, other photos and further updates, you can follow Babzen Kebab on Instagram and like their Facebook page. 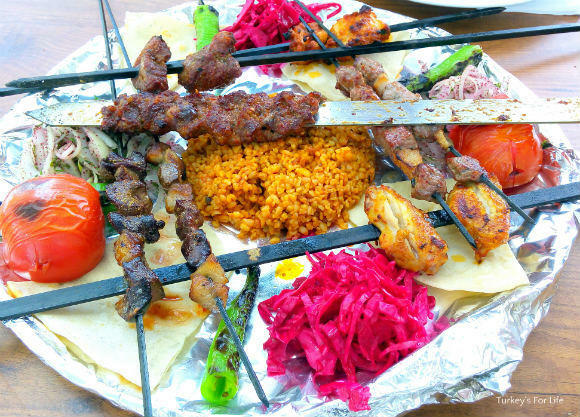 Babzen Kebab is in the Çalış section of our page of places where we’ve eaten around Fethiye. You can book rooms at Hotel Belis Garden through Booking.com. We visited here tonight! Excellent thank you for the recommendation.